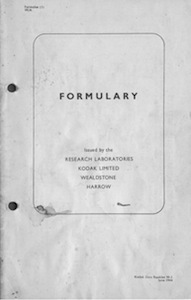 Amongst all the photographic ephemera and paraphernalia I own there is this copy of a Kodak Formulary, published in 1944. I’ve scanned this and converted it to full-text PDF file. Bearing all the signs of wartime austerity, it nevertheless contains a wealth of information on published Kodak recipes for all kinds of photographic processing solutions. You can download a searchable PDF copy by clicking the image above.